Information discovered in spring 2008 indicates that small lead fragments often are present in hunter-harvested venison, particularly ground venison. 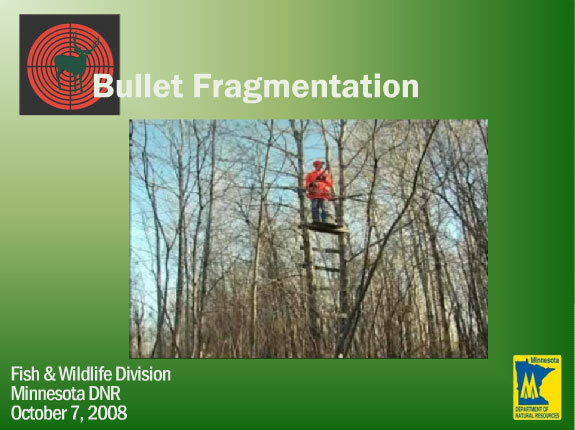 As a result, the Minnesota DNR conducted the first-of-its-kind lead fragmentation study to simulate how different types of bullets commonly used for deer hunting might fragment. To date, no illnesses have been linked to consumption of lead particles in hunter-harvested venison. But the DNR recognizes that the potential impacts of lead fragments ingested when eating hunter-harvested game are not well understood. Only now are state and federal health, wildlife and food safety agencies beginning to collect, study and analyze data to determine exactly what those impacts may be. DNR Fish & Wildlife Division staff designed the study using firearms and ammunition commonly used by Minnesota deer hunters. The results are not exhaustive but they do show that all bullets fragment, some more than others, and make it clear that lead fragments travel much farther than expected. Before you go into the field this fall, consider the information presented in the links below. Watch our online presentation or download it for reference. Use the information to make your own decision about the ammunition you choose. Hunting is more than a Minnesota tradition. It's part of our heritage. It's part of our families. It's part of our future. Your DNR wants to keep it that way. This online presentation presents the study's finding in an animated and narrated, easy-to-follow format. Links are provided that allow you to download supporting documents. View The Short Research Summary A summary of the study and its findings. Download The Complete Research Summary (13 pages | 138k) An in-depth explanation, discussion and analysis of the study, its design, the way it was conducted and its findings. Tips For Hunters The DNR has assembled nine tips that provide hunters with helpful and useful information.